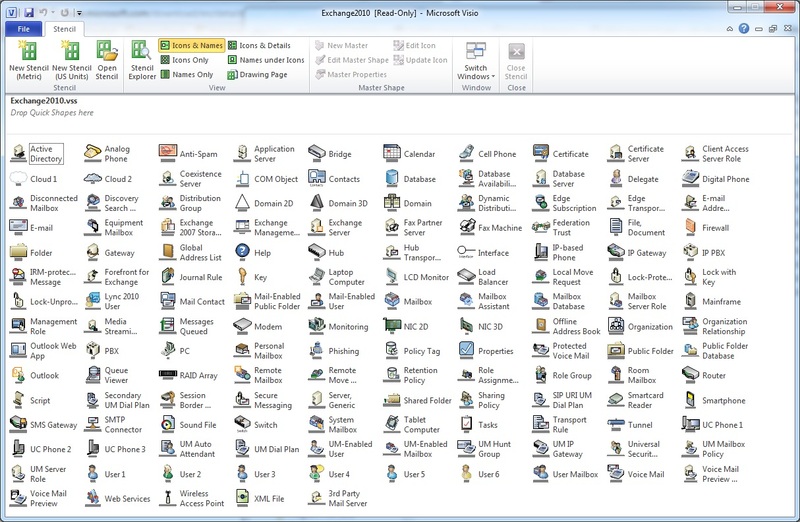 Microsoft has made an updated Microsoft Office Visio stencil for Exchange 2010 SP1 available for download. As you can see from the screen capture, a wide variety of shapes is available in the stencil including some for Windows components (Active Directory, Certificate Server, domains, etc. ), people, and other parts of the Exchange infrastructure such as client computers. The download page says that the stencil contains shapes for “Features new to Exchange 2010 SP1“. Maybe these are the cloud shapes to allow for connections to Office 365, but I can’t see much else new. Nevertheless, this stencil is a very valuable download for anyone who has to document anything to do with Exchange 2010, providing of course that you use Visio! The shapes are enormously helpful to describe the components of an Exchange organization and its points of contact with Windows, network, and other applications. You can create documents and presentations that describe the layout of Database Availability Groups (DAGs), individual servers, and so on. All in all, very useful indeed. Although it’s great to have such a varied collections of shapes for use in diagrams an idle thought does occasionally cross my mind as to how the graphic designers who put together the stencil come up with some of the shapes. After all, it’s reasonably straightforward to imagine what might be an appropriate shape for a digital certificate or an LCD monitor, it’s altogether more challenging for those who lay no claim to artistic competence to design a shape that is immediately obvious as an IRM-protected message or IP-based phone. Of course, some of the shapes become well-known because they are used elsewhere in the product or are in common use outside Exchange so it’s easy to recognize objects such as a mail-enabled public folder or Exchange server. Other shapes have aged and been passed by developments in technology. The cell phone shape, for instance, looks suspiciously like an old Motorola RAZR phone and not at all like the phones used today. However, there’s a smartphone shape to take up the slack and bring everything up to date. In summary, this free download delivers real value. If you haven’t tried using stencils to help in project documentation before and have a copy of Visio to hand, you should give it a whirl. Update 23 April 2014: The Exchange 2013 edition of the Visio stencils (including Office 365) are now available from Microsoft’s download center. This entry was posted in Active Directory, Email, Exchange 2010 and tagged Exchange 2010 SP1, Exchange 2013, Stencils, Visio. Bookmark the permalink.